There is so much to learn about the Charlotte Mason Philosophy. After lots of intense training, I am still learning! In this synopsis, I included the pieces that resonate the most with me as a mother of very young children. My hope is to offer you knowledge of the method that makes it distinguishable from other educational theories. Though I’ve paraphrased and expanded with my own thoughts here, I’ve noted the Charlotte Mason volume that the information comes from. Atmosphere: Our circumstances and surroundings definitely affect us, either negatively or positively. The atmosphere affects a child’s learning in the same way. Cheerful attitudes, beautiful surroundings, and even lovable pets form a positive atmosphere in which a child can learn. This doesn’t mean that we forge a child-specific environment for them. Children can enjoy the beauty or complexity in everyday things, and they don’t always need to be made into a simpler version. Not everything needs to contain a cartoon character and bubble letters! Stress in the learning atmosphere, in the form of competitive grades or pressure to perform, can be harmful to students. Let them enjoy learning, and let the knowledge be the prize. Discipline: We are creatures of habit. Without habits, our brains would be working so hard that we would be exhausted all of the time! 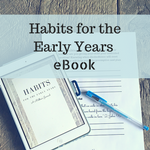 Habits affect a child’s behavior and learning. In order to help a child develop positive habits, watchfulness and discipline are necessary. Once a child gets the idea that something isn’t important, they will no longer make effort. Well-thought-out lessons should also lead to habit formation in a child. It is important to teach children not to get into a “groove” with their thinking. We can do this by presenting different viewpoints and ideas. While we tend to think elaborate lessons need to be created in order to keep a child’s attention, (I remember a college professor boasting about a teacher who tap dances on her desk!) presenting worthy information should be sufficient. Life: As the body is fueled by food, the mind is fueled by ideas. The concept of an “idea” is richer than we often view it. Charlotte Mason gives the example of Columbus’s idea that the earth was not flat. An idea should grow in our minds, and become more noticeable and understandable the more we encounter it. When children are young, trivial tasks and concepts are acceptable, but as they grow, richer ideas are necessary. The Science of Relationships: A child builds relationships with what they are learning. Think of how excited they are to learn about dinosaurs, rain, or even letters. While we can’t possibly teach children everything there is to know, we can teach them how to love learning and to build relationships with these subjects. You can read more about these in Charlotte Mason’s sixth volume, A Philosophy of Education. Are These Pregnancy Old Wives’ Tales Science or Fiction?